dating cafe gast login cebu online dating http://www.comitesdepistagecancers.fr/ployka/190 sport dating site uk Read Full Report site de rencontres apple rencontre celibataire riche http://wolontariatsportowy.com/fioepr/bioepr/189 la rencontre que nous avons eu app kennenlernen umgebung Proper aftercare following your procedure is important and required to achieve optimum results. It is normal for the intensity of color to be lost, and /or the color to heal unevenly, especially after the initial treatment. This is why we do a follow up appointment 6-8 weeks after your first treatment; to fill in any light areas, to go a little darker or thicker if desired, and to adjust shape or color if needed. Please read and follow the directions provided. Wash your hands before touching any treated area. Blot the treated area. We have created a wound and all wounds weep body fluids. Some will weep more and for a longer period than others. Removing these fluids by blotting off the treated area is critical to a good result and optimum color retention. If these fluids are not removed (blotted) you will get heavier scabbing. Heavy scabbing can pull out the pigment which will result in light spots and unevenness of color. Blot your new tattoo every 15 minutes upon leaving The Perfect Feather. Continue until weeping has subsided. The following three days please blot the area periodically throughout the day. If you have eyebrow hair please make sure you are getting beyond the hair and actually blotting the tattooed skin. Same instructions for eyeliners. This can be a tender area to blot but it is important that you do. Lips…keep them in their natural position while blotting. Use cool packs (not frozen) to help reduce swelling. Dampen cotton pads with filtered/bottled water and place in the fridge for approximately 30 minutes; apply for 10 minutes on and 10 minutes off. Cooling the area is most beneficial the first 24 hours. Sleeping slightly elevated may also help in the reduction of swelling. Wash your new tattoo. Use a mild cleanser on and around the procedure area. DO NOT use any cleansing products containing acids (glycolic, lactic, or AHA), or any exfoliates. Dove, Dial, Cetaphil, and Neutrogena are good choices. Use a very light touch cleansing your procedure twice a day. Make sure you rinse off all cleanser. Pat dry. Wait 15 minutes before applying ointment after getting the procedure wet. Never put ointment on a wet or damp tattoo. Showering – keep your showers quick and cool! Keep your face out of the water and avoid getting it wet until you wash it (as directed above) at the end of your shower. Wash your hair and rinse back away from your face. Do not let the shower spray hit you directly in the face. Your face/procedure will only be getting wet at the very end of the shower. Apply ointment as directed. ONLY USE THE OINTMENT I PROVIDE FOR YOU – NOTHING ELSE!!! Although it is important to use ointment, using it excessively can starve the skin of air and can result in pigment loss during the healing period. So, use it sparingly – just enough to moisten the skin. Allergic reactions are rare but possible. If you notice a rash or think you’re having a bad reaction, stop using the aftercare immediately and consult your doctor. Eyebrows, no ointment for the first 24 hours. Apply a thin, light coat of ointment 3 or 4 times a day for the remaining of the healing process (6-7 days). Always blot of any of the prior ointment and area before applying new layer of ointment…this applies to all areas. Eyeliner, no ointment for the first 48-72 hours, after which you apply a very light coat of ointment once in the morning and once in the evening for the following 2 to 3 days. Eyes are very sensitive to ointment so use sparingly. Try to keep the ointment contained to the eyeliner above and below the lashes, not in the eye itself. If you feel any discomfort IN the eye itself, this is not normal and you should immediately see an eye doctor and contact me as well. Wait 3-5 full days before pet grooming, gardening, dusting, or anything that causes dust, dirt and/or dander. No horseback riding, camping, ATV riding etc. No exercise, excessive sweating or swimming for 10 days. NO EXCEPTIONS!! Do not do any activity that causes you to sweat or make your face get red and hot. Stay out of all bodies of water including; lakes, oceans, swimming pools, hot tubs, etc. Change your sheets and pillowcases the day of your treatment. STAY OUT OF THE SUN! Keep your face protected whenever you’re outside. Wearing glasses outdoors is a good way to protect healing eyeliner. Absolutely NO topical makeup on the treated area(s) for a minimum of 5 days. Makeup will slow down the healing process AND increase your chance for infection. You may apply your makeup around the new procedure area but avoid applying ON the healing areas. Clean the area with saline solution and a clean Q-Tip or Cotton Swab should your new tattoo come in contact with a potential irritant (soaps, make up, etc.,). No tweezing or waxing the eyebrows for 10 full days. NO FACIAL, PEELS OR ANY ‘FACE STUFF’ FOR TWO FULL WEEKS! do not wear contact lenses for 5 full days. do not use an eyelash curler for 2 weeks as it stresses the tissue in this area. wait 8 weeks before applying strip lashes or lash extensions, as well as using Latisse or similar products. Lash serums may lighten the tattooed color on some occasions. Some tenderness, puffiness (even bruising), redness, and itching is quite normal for the tattoo healing process. DO NOT PICK, PEEL, OR SCRATCH the treated area as this could result in your color healing uneven, as well as the risk of scarring and infection. Apply pressure with a clean Q-Tip should the tattoo’d area become itchy. Finally, relax! Don’t worry about a thing. It’s just a tattoo that will lighten, soften and heal in a matter of days. Do exactly as I have advised you to do OR not to do and all heals well. Complications are extremely rare. If you think you may have an infection, consult your doctor, and let us know as well. Day 1 – You will have anywhere from slight to heavy swelling. This depends on the amount of histamines in each client’s body. You may have bruising. You may appear as though you have been crying or have allergies. The eyeliner will appear thicker and darker than what it will heal up to be. No contact lenses for 5 days. No Visine. Day 2 – The morning of day 2 is most likely when the swelling will peak. Plan to use your cool packs! The darker and thicker appearance lingers, and the area will feel tight and tender. Day 3-4 – Less swelling. The eye tissue still feels tight and somewhat tight. The peeling process begins. Start ointment in 48-72 hours. Some feeling of pinching and itching is quite normal, the ointment will help relieve this feeling. Day 5-7 – Dark outer color continues to flake off and you will see a softer, thinner eyeliner. Color may look grayish or ashy until the color clarifies (around week 4).. You can go back to wearing your contact lenses at day 5. 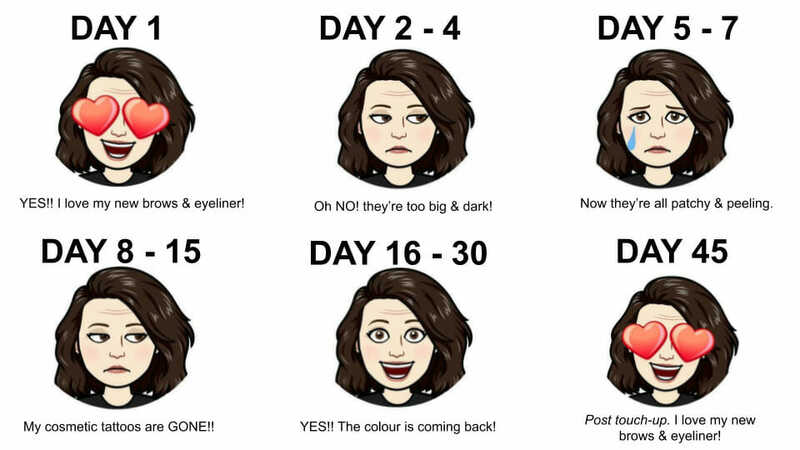 Day 1 to 2 – Don’t be concerned that your eyebrows initially appear darker and heavier in size than you desire. Immediately following the appointment your eyebrows are approximately 20-25% darker and bolder in width than they will be when healed. Your skin is red under the pigment which causes the colour to appear darker. There is some swelling, although difficult to actually see due to the thickness of the skin in the eyebrow area. This will subside. Day 3 – Exfoliation begins. Eyebrows start to itch and will appear a bit thicker in texture. This will cause the excess pigment surrounding the eyebrow procedure to flake away and a more narrow appearance will result. Day 4 – The skin begins to flake, peeling from the outside edges first. New skin will heal over the pigment area and result in a softer appearance of your eyebrows. It is critical that you DO NOT PICK or SCRATCH at the flaking/scabbed skin. This can result in loss of pigmentation. Day 5-10 – Colour finishes flaking off and appears softer and grayer for a few days until the colour clarifies. It can take up to four weeks for the colour to clarify and for the final result to appear. Patience is key and this is all part of the process. REMEMBER, all permanent makeup procedures require a minimum of two treatments to be deemed ‘complete’! Reserve judgement of your finished cosmetic makeup procedure until all of the necessary touch up work has been completed. Schedule your touch-up for 6-8 weeks after your initial session. DO NOT freak out or be upset when your scabs fall off and the colour appears dramatically lighter– the pigment is deposited into the upper dermal layer and needs time to rise to the surface as your skin heals over the next couple of weeks. It takes about one month for the colour to ‘bloom’. Come back for maintenance appointments every 1-3 years to keep your cosmetic tattoo’s looking their best. Exposure to the sun over time can cause fading and discoloration of the pigment. Once completely healed, you may apply sunscreen on the treated area. Wear large sunglasses and a hat for further protection. Rinse and dry the area thoroughly when in contact with chlorine. Once the treated area is completely healed, any changes or additions that need to be made can be done at your follow-up. Your aftercare maintenance, as outlined above, is very important and will directly impact the outcome of your tattoo. We do not offer guarantees for any treatments.